Indexable Carbide Insert Drill suit large dia applications. Available in coolant-through 2XD, 3XD, and 4XD body lengths, WDX Series drills holes and can also perform operations such as turning and boring. Nickel-plated steel body accepts same insert geometry for outer and inner cutting edges, and design allows use of all 4 of insert's cutting edges. Featuring Super ZX-coated carbide insert grades ACP300 and ACK300, WDX is capable of machining steels, stainless steels, cast irons, and exotic materials. Mount Prospect, IL - (March 10, 2009) Sumitomo Electric Carbide, Inc. recently unveiled its new WDX Indexable Drill Series for large diameter hole drilling. The WDX not only accurately drills holes, but can also perform operations such as turning and boring. The drill's nickel-plated steel body reduces inventory costs by accepting the same insert geometry for both the outer and inner cutting edges, and allowing the use of all four of the insert's cutting edges. 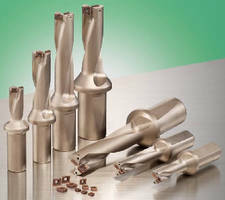 The WDX inserts are available in three newly developed drilling chipbreakers to reduce thrust. Featuring the Super ZX-coated carbide insert grades ACP300 and ACK300, the WDX effectively machines a wide of steels, stainless steels, cast irons, and exotic materials. The WDX Drill is available in coolant through 2XD, 3XD, and 4XD body lengths to provide a solution for a multitude of drilling applications.